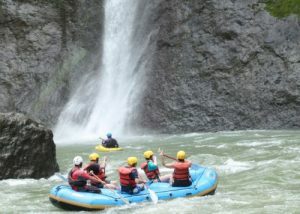 Overnight Rafting on the Pacuare River is invariably the highlight of our client’s vacation in Costa Rica as The Pacuare River is the undisputed crown jewel of all the Costa Rican Rivers. 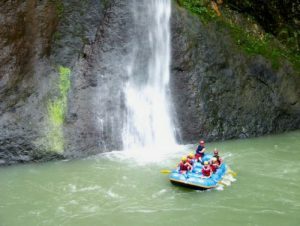 National Geographic called the Pacuare one of the top two rafting rivers in the world. On its way to the Caribbean Sea, the Pacuare plunges through some of Central America’s last untouched tropical rain forest. In between the class III and IV rapids you’ll gaze in wonder at the primordial forest and its wild inhabitants. The Pacuare River Gorge is home to thousands of exotic creatures such as sloth, monkeys, toucans, and the elusive jaguar. This lush paradise is accentuated by literally dozens of spectacular waterfalls crashing down hundreds of feet into the blue-green waters of the Pacuare. After a leisurely Breakfast at your hotel we’ll take the short drive to the tiny mountain town of Tres Equis where we’ll begin our wild descent into the heart of the Pacuare River Gorge. At the put-in your guides will fit you into your life jackets and helmets and give you a thorough safety demonstration. Then, it’s time to shove off. In no time at all, you’ll be crashing your way through some of the best white water in the world! About half way down the run we’ll pull over at our own private jungle camp accessible only by the river. This splendid oasis comes with a fully equipped kitchen, full bathrooms, showers, an open air dining area, and thousands of acres of pristine atmosphere. The camp has dozens of trials to explore and a secluded pool at the base of yet another beautiful waterfall. While you are off exploring (or relaxing in one of the delightful hammocks) your guides will be busy preparing the all important happy hour. Sip on a chilled martini, a nice glass of wine, or an ice cold beer, either way, the drinks are on the house! As evening descends on the jungle we’ll sit down to a delicious gourmet dinner. As you dine, the jungle will come alive as the nocturnal creatures begin to stir and ad their voices to the forest’s symphony. When it’s time for bed you’ll be lulled into a peaceful slumber by the sounds of the forest and the river sliding by.